I often spend time looking at maps of different areas always on the lookout for something new or off the beaten path to go and explore. This past spring one such area not too far from home caught my eye. I asked around and although a few folks I talked to knew of the area they had not tripped through the area, so that settled it and I decided to go check it out. I left home in Sudbury around 8:50 in the morning and after picking up a coffee I was at the put in on Matagamasi Lake at 9:55. A quick 10 minutes to unload the canoe and gear and I was on the water by 10:10 and heading north. As is my usual luck when paddling this lake there is a stiff headwind for about 4 kms till I pass the north east arm of the lake and then I'm more sheltered and the wind slackens off. It is a gorgeous spring day, temperature is running around 20 Celcius and the blackflies are out although they are not as bad as some trips yet I do use some DEET on the portages. After Matagamasi Lk. there are 2 portages around a series of rapids and waterfalls on the Chiniguichi R between Silvester and Matagamasi Lakes. Although it is only mid May the water levels are the lowest I've seen for this time of year. With the great paddling conditions I opt to head up through Silvester-Wolf and Dewdney lakes and cross the portage into Chiniguichi Lake and stay at the first campsite in southeast bay about 3/4 km from the port. I arrive at 17:30 and set up camp, eat and enjoy the loons and the sunset. It is not a well used route and I had been unable to find any mention of it or anyone who has canoed it recently so I decided to just go explore the route and see if I could find the old portages etc. The first portage out of Chiniguichi is in the southeast corner of McConnell Bay. I headed to the area and found an old portage on the right hand side of the small creek flowing out of the lake (70 metres) although the Nastawgan map has it on the left. It was marked by an old piece of flagging and although the trail is getting overgrown it was discernible but not used much very recently - maybe by a local trapper in the winter months in the past. I continued south for about a km to a large beaver dam and portaged left around it (40 metres). It is about 3/4 km to the next portage. I paddle up to the base of a small series of waterfalls and find a rough overgrown trail on the right up to the next lake. It is a steep takeout and not a lot of room but it is only about 75 metres long. There is an old blaze on a large pine on the upper end of the portage but it is quite overgrown through the middle section. Again, it is only about 3/4 km to the next portage which is in a low swampy area, I paddled in as far as possible and I checked both sides and elected to go to the left side as it was not as overgrown and somewhat drier. This portage is approx 200+ metres long. I just picked the path of least resistance though to the the other side through the fairly dense undergrowth. I didn't find or see any blazes or old tape that marked a possible portage here but then I also didn't walk the right hand side of the creek either! The other side is the north end of Marjorie Lake which is over 4 km long in and lies in a north-south orientation. As it is now afternoon the winds are up and as usual in my face again. The north end of the lake is separated from the main body of water by a 300 metre narrows and the winds are quite brisk as I head into the main lake area. I had planned to spend the second night here and I head down the eastern shore looking for the old marked campsite. It is found on the east shore where the lake narrows again. It is on a rock shelf about 20' higher than the lake level and with the wind it is virtually bug free. I set up my hammock and then snooze in the warm afternoon sun. I arrived here about 15:00 in the afternoon so it was a relaxed pace and the portages were'nt to difficult although the blackflies were more plentiful than the previous day. Another nice morning with a hint of a breeze and some high wispy cloud that indicates a front will passing through the area later today. I eat and pack up and head off to the south end of Marjorie Lake. The next portage will take me over a small height of land into Rathwell Lake. The water in Marjorie flows north to Chiniguichi while the next couple lakes flow south into Wolf Lake. The south end of Marjorie Lake is low, swampy and slowly filling in with floating bog type vegatation etc. I choose to begin the portage on the left as it is lower and flatter than the right side. It is about 70 metres to the end of the bay where I find an old blaze and some ribbon that marks the portage. It is overgrown and a bit of a bush thrash to the next lake (500 metres) but I can see that it is going to be long day of trying locate the old ports and then get my canoe and gear across them. The other side is a bit flooded and there are a couple of downed trees on the shoreline as well. The next lake is Rathwell Lake and it too is a beautiful lake with granite outcropping and lots of mature pine surrounding the lake. 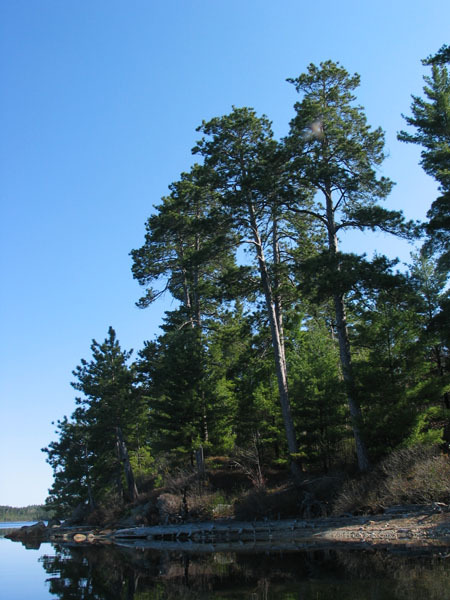 The west shore is a fairly high ridge and the east shore is dominated by rock shelves covered in pines. The exit from Rathwell is from a long narrow arm in the southeast corner of the lake. Once again I find an old blaze at the south end of Rathwell Lake, however the trail is even more overgrown through here. Someone has placed a few flagging tapes which help as the trail is not really evident or worn in the least. The trail dives down a side hill through a balsam thicket and another small boggy area that you need to canoe across. There is another old blaze across this small pond area that is quite evident. From here I managed to find enough old blazes and old flagging tapes to find a route across to the next put in on Laundry Lake. This interrupted portage I'd estimate at about 7-800 metres in length through some thick brush in places. On a warm muggy day in mid May it becomes readily apparent that a bug net and DEET are your best friends! Laundry Lake is the last lake in this chain before you once again portage back into Wolf Lake. The old portage to Wolf Lk. is supposed to be located on the south west shore of the lake. A quick look at any topographic map of this area makes it readily apparent that this will be one tough portage as the contour lines are tightly packed between the lakes. There is an outlet with a small creek that flows down into Wolf Lake but it is not navigable and very overgrown and rough. I did find some old blazes on the shore but the trail was not visible and the undergrowth was fairly thick and with the approaching weather I opted for another route out of the lake. Just to the south of the lake is an old logging road that is used by ATV'ers which is only about 100 metres from the end of the southeast arm of the lake, unfortunately it is also straight up! Someone has cut a rudimentary trail and I used it to get up to the road. I used the road to portage along till I reached the creek flowing into Wolf Lake which is only about 175 metres from the road. However, you portage your gear for about 1.5 kms and you gain and lose over 250' in elevation, twice!! - fortunately there was a breeze and the bugs didn't feast too much. I leap frogged my gear along the road and I'd say it took me about close to 90+ minutes to complete this portage. Once you are back in the canoe you must also deal with a large beaver dam at the lake proper before you are free and clear to paddle down Wolf Lake. I headed for the campsite at the southwest end of the lake for the night as the winds increased due to an approaching cold front. I set up and ate supper and the front rolled through with rain and a signifcant temperature drop - probably + 20 to + 5 Celcius or so. It did take care of the blackflies however. 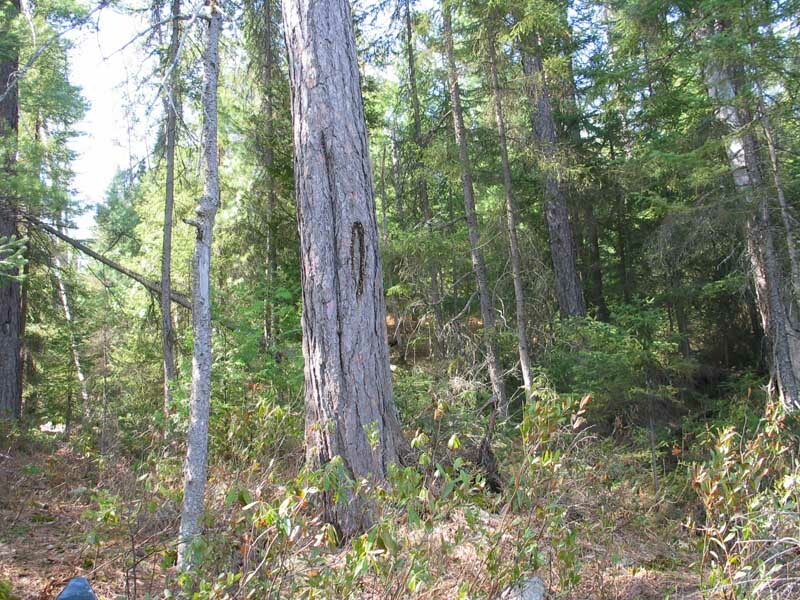 This campsite is in some old growth red pine and suitable for a large group. There are also the remains of an old log cabin on the point in this location. This was a long tiring day of paddling and searching for the portages and then bushwhacking through them, upwards of 3 times due to the searching for the trails plus carrying my gear- I had left at 8:30 in the morning from Marjorie Lake and reached my campsite on Wolf Lake at 16:30. I awoke around 6:00 to a cold northerly wind, rain and fog and a temperature of about +1 Celcius. Since I didn't have too long a day ahead of me I stayed in my hammock warm and cozy till the rain quit and the sky began to break up around 9:30. After a couple cups of hot tea and breakfast I packed up my soggy, damp gear and headed for the takeout as the skies cleared and the sun came out at 11:00. The wind stayed up all the way down Matagamasi Lake but I was paddling with the wind for a change and I was off the water and headed home by 15:30. A nice loop that gives canoers another option in an area used fairly heavily. The portages are fairly overgrown but they are there! The route I took to get from Laundry to Wolf Lake is not the traditional Nastawgan and there are a couple places on the southwest shore of Laundry with blazes that may or may not mark the start of the old traditional portage. I will probably go back and spend some time and effort and see if I can locate the old portage. In addition there is a portage into the north end of Marjorie Lake that I didn't find and it may well have been on the other side of the small creek and it would be good to locate and confirm this as well. Some of the portages start/end at the end of small bays that in low water are filling in of have some downed tress etc so some small amounts of bushwhacking was/is necessary to get to the portages or canoeable water. It wouldn't take a lot of effort to clean up the portages to make it somewhat easier to locate and traverse them. It appears that at one time this was a more travelled route that has since fallen into disuse, although there was the odd sign of passage along the way in addition to the blazes and flagging tape that I found that led me to believe I wasn't the only one through the route in the last few years. "There are no shortcuts to any place worth going" - anon. It is now November of 2008 and the portages on this route have been re-established by a friend of mine, Mike MacIntosh this past summer. In addition Brian Back of Ottertooth.com has posted an excellent overview map and brief history of the "lost" but newly re-opened Nastawgan Here.